Jerith Patriot Steel Fence Posts | Hoover Fence Co. The Jerith Patriot™ Post are a key component in the Patriot™ fencing system. A unique thing about these posts is that they are all "blank", but include the appropriate brackets and hardware for installation because this style doesn't utilize routed posts. FenceCoat™ powder coating on all components, black only. What are the differences between Line, End, Corner, Blank and Gate posts? 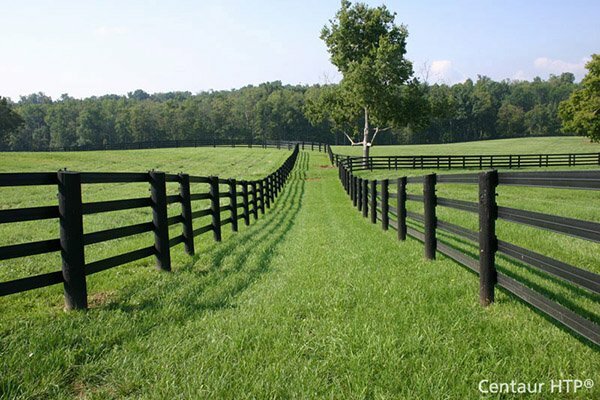 For most styles of fence there is a difference in posts. The posts of most styles of fence are routed to accept the rails from the sections. For the Patriot Ornamental Wire Fence sections this is not true. All posts are "blank" posts, meaning they are not routed. The Patriot fence system uses "rail end brackets" to attach to the posts, therefore all the posts are the same. Posts are still ordered as line, corner, or end posts because the appropriate fittings are included with the post. Post caps are also included for all posts. 6' high posts also include 2 brace bands. Line posts are not included with the sections. Items are sold separately so that you only need to order the parts you need for a particular job. Some cases may require mounting an end section to an existing structure or post. Some jobs may require mounting all sections to existing posts or posts other than the regular 2" steel posts that go with the wire fence system, therefore posts are purchased separately. Are post caps included with the purchase of a fence post? Yes. Standard "flat cap" post caps are included in the price for the Patriot wire fence system. The post spacing on the Patriot system is 72" on center. Fence sections are smaller, fitting between the posts. Do I need heavier posts on both sides of the gate? No. The regular 2" steel post can support a 6' wide gate in 4', 5', and 6' height. When mounting a gate post it is recommended to make the hole deeper than a regular post used as a line, end, or corner post. The gate post still is the same depth in the ground as the fence posts but the concrete footer should be deep enough to assure it is below the frost line (minumum of 36" required for all heights). In cases where the fence section attaches to a post at an angle other than 90°, the regular rail end brackets cannot be used. In this case, which is not so rare, adjustable rail end brackets must be used. These brackets can adjust to the angle needed to attach the rails to the post. I am unable to set a post tight to a building due to an obstruction buried in the ground. How do I accomodate this? It is not abnormal to find a protruding foundation footer, drainage pipe, or other obstruction next to a house or building. There are many ways to go about setting this post in concrete and keeping the post tight to the building. We have resorted to many methods, including welding and building special posts for these applications. When fence posts are made of steel, aluminum, vinyl or other bendable materials, simply bend the post to miss the obstruction. You will need to dig the hole to the proper depth regardless. Usually the post is bent to miss the obstruction and into the alternate hole.